Thirteen-year-old Rodney Becker has found the perfect cure for stage fright. Voodoo! Armed with the stolen finger bones of a dead blues guitar player and a mishmash of voodoo spells from the Internet, he and his best friend enter a graveyard at midnight to perform their ritual. 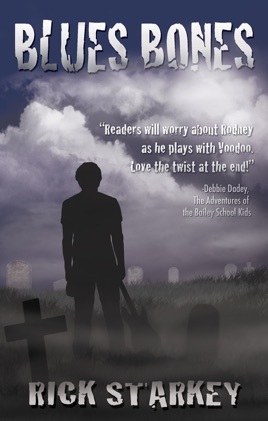 Now, all that stands in his way of winning a local guitar competition is the power of RETURN – a side effect of the voodoo that spells disaster for Rodney. His cure has become a curse. How else can he explain jamming his finger so bad he can't hold a guitar pick, his part-time dad stealing his guitar, and his mom getting into an accident that could have taken her life? How much is Rodney willing to risk to achieve his dream of being a guitar legend?